There’s an important difference between always taking the middle ground in an argument and recognizing nuance where many find none. Analytics are a case in which it is important to remember, whether it’s with corsi, or PDO, or fighting, or any other issue, that because of the imperfection of our metrics, our understanding of psychological factors at play, and our understanding of just what goes on behind closed doors, that what the numbers tell you isn’t always entirely accurate. This nuance is something that I’ve tried to emphasize with this blog over the past few months, and will continue to push. There isn’t a middle ground just because somebody says there should be…there’s a middle ground because of the number of factors in play that simply haven’t been taken into account by any model we have at our disposal right now. Recently, there’s been some criticism of Boston Bruins coach Claude Julien for his decision to play Tuukka Rask on both halves of back-to-backs – he’s done so twice already this year, and may do so again tonight and tomorrow night against division foes. It’s easy to look at something like goaltending performance in back-to-backs, and say “case closed.” But it’s important to scrutinize every claim that is made, whether it’s by an NHL GM, a coach, a journalist, or a statistician. Eric Tulsky, obviously one of the best in the business, found in 2012 that over a sample of two seasons, goaltenders see a drop of about 1% in save percentage when starting a second game in two nights – at least versus starting a fresh goaltender in that second game in 48 hours. Here’s the critical table from that piece at Broad Street Hockey. It’s not unreasonable to believe, from this evidence, that on average starting a fresh goalie in the second half of a back-to-back leads to a save percentage 1% higher. It’s important, though, not to extrapolate as far as to say that this means that starting the fresh goalie is always the right call in these situations. In order to show why, I compiled what I felt to be a good estimate of each goaltender in the NHL’s current true talent save percentage. To do this, I took their complete numbers – regular season and playoffs – since the 2011-12 NHL season. That way, the sample size (for the majority) is still large enough, but it’s not confounded by numbers from a decade ago that may or may not have relevance. A Marcel model may have been preferable, but I felt this was a pretty good estimate. 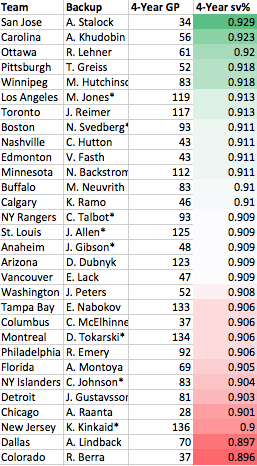 For goalies that didn’t have at least 40 NHL games in that span, and that had at least double as many AHL as NHL games, I used Stephan Cooper’s AHL-to-NHL save percentage translation (approximately 8% as of 2012) to find the best guess for true talent NHL save percentage for those goalies. Adjusted AHL numbers are used for those goalies marked by an “*”. The column to the far right is the difference between the estimated true talent save percentage of the team’s current starter (based on games played this year) and backup. As you can see, slightly more than half of the teams have a difference of greater than 1%. For a team like New Jersey, for example, starting Kinkaid – rested – over Schneider – tired – on the second half of a back-to-back would mean losing ~1.5% on the team’s save percentage for that game. So it’s certainly not as easy of a call as the Flyers say, going from Mason to Emery. Now obviously there are other factors to take into account. If you assume that a backup needs to play 20 games in a season, it makes more sense to have them play games during back-to-backs, because the drop off in save percentage will be greater if you’re sitting a rested starter. But let’s say Alain Vigneault feels his team really needs a slump-busting win one Saturday night, and that the loss in overall save percentage taken by starting Lundqvist now rather than a game down the road was worth it for team morale and momentum, then it’s not necessarily the wrong move. Or, even more obviously, let’s say Colorado is playing a back-to-back to end the season, and desperately needs two wins to make the playoffs. I think it’s safe to say that starting Varlamov for both of those games is the right call. Same idea for back-to-backs in the playoffs, if any came to be. The point is, fans, statisticians (I prefer to call them/us analysts), and journalists will often take analytical findings like corsi or the idea of splitting back-to-backs – concepts that are true on average or on a league-wide level – and forget that on the micro stage, for particular teams, those results might not hold. If you don’t have team-specific information, then the right call would generally be to split the starts, but we do have that extra knowledge, so if you’re a coach or a GM, you have to put that to use. So is Julien making the right call to play Rask two nights in a row? If he feels that wins now are more important than wins later, for some reason, then yeah. Otherwise, unless he expects his starter to see 75 starts this year, he might have been wise to play the long game and give Svedberg some action. The point is though, the decision is more complex than simply looking at a league-wide table. 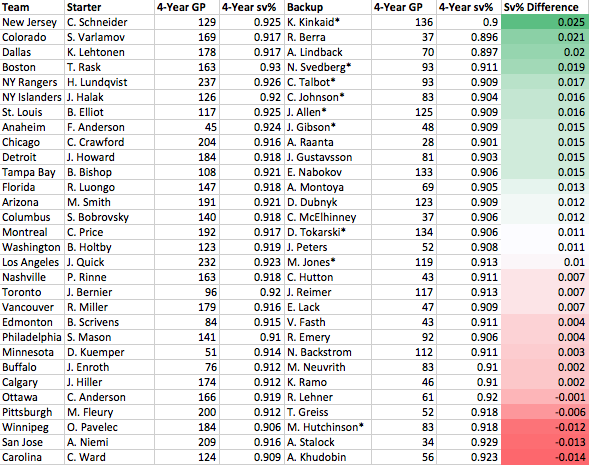 Finally, since I’m sure some have interest in this, I’ve sorted the table above to find the best starting and backup goaltenders by combined save percentage over the past 3+ years. Here are the results. For AHL translations, Stalock and Johnson’s results were impacted the most by the league that was chosen. This entry was tagged analytics, back-to-backs, bruins, devils, flyers, goalies, kinkaid, nhl, rask, save percentage, schneider, svedberg, tulsky. Bookmark the permalink.